Creating a robust innovation ecosystem is one of the core strategies of Milwaukee 7's regional economic development plan, the Milwaukee 7 Framework for Economic Growth. As today's global economy undergoes a fundamental transformation driven by knowledge-based assets, regions need to capitalize on innovation - the only long-term driver of overall growth. To identify the region’s place on the path to transformation and articulate a set of integrated growth strategies, M7 engaged a broad array of regional stakeholders in the Brookings Institution's Metropolitan Business Planning process: a proactive, fact-based, action-oriented approach to targeting, aligning and leveraging regional assets for inclusive growth in the next economy. The Metropolitan Business Plan produces a shared roadmap for the region, aligning existing and new initiatives around a common vision. It begins to identify a portfolio of potential new initiatives built around the leverage points of industry clusters, talent, ingenuity & entrepreneurship, infrastructure and governance. Each of these market levers is supported by a set of strategies to guide economic growth in the next economy and power sustainable prosperity. Industry Clusters - Build and strengthen industry clusters. Create optimal interaction within concentrated cluster industries to improve efficiencies and productivity. Align sector functions and occupations. Talent - Develop and deploy talent. Grow supply of skilled workers to meet employer demands. Grow demand for skilled workers by cultivating appropriate jobs. Ingenunity & Entrepreneurship - Innovation drives increasing productivity and efficiency - the source of all long-term growth. Develop inputs and mechanisms to facilitate innovations, interactions and commercialization. Infrastructure - The location of firms and workers within the region determine costs for people and businesses. Minimize transportation costs, reduce congestion and avoid segregation and concentrations of poverty. Governance - Promote civic engagement and build effective civic institutions to attract entrepreneurs, enable markets, lower transaction costs and increase deployment of assets. 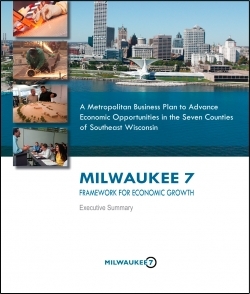 Reflecting the assets, challenges and opportunities revealed in the market analysis and business planning process of the Milwaukee 7’s regional plan, an integrated set of nine strategies have been developed to move the Milwaukee region forward on the path to new-economy growth. 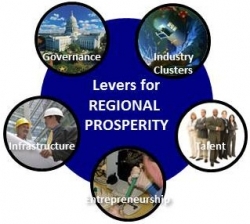 Each strategy is designed to increase the productivity of local firms by leveraging the region’s unique strengths, taking advantage of its emerging opportunities and addressing its most critical challenges. These strategies are deliberately crafted to cut across market levers and be mutually reinforcing: through coordinated implementation, their impact will be enhanced. Together they build upon current assets and momentum to enable the Milwaukee region to realize its potential to become a leading place to do business in the next economy, and a thriving, prosperous and dynamic region. The Regional Economic Partnership (REP), Milwaukee 7, Wisconsin Economic Development Corp., and Southeastern Wisconsin Regional Planning Commission worked together during 2014 and 2015 to develop a Comprehensive Economic Development Strategy (CEDS) for the Region. A CEDS is designed to bring together the public and private sectors to develop a strategic plan to diversify and strengthen the Region’s economy. The CEDS has been adopted by each of the seven county boards in the Region, and was adopted by the Commission in December 2015. The CEDS provides a basis for a more widespread understanding of the ongoing economic development work program in the Region, which draws heavily from the work of the Milwaukee 7 organization and its Framework for Economic Growth strategy. >>View the CEDS Plan and materials.